« We Should Be Grateful for Frikarts Aster. Flowers So Beautiful You Could Wear Them as Earrings. This September has been extraordinarily wet, in fact we have set a record for the most rain for this month every and still almost week to go. Most plants are loving it as the long summer drought is over early and this is guaranteed to save some of their lives. Some plants think it is fall already while others think it is spring and are blooming out of season. One plant which is in its glory during the waning days of summer is Hardy Fuchsia (Fuchsia magellanica) all its lovely forms. One of the many forms of Fuschia magellanica blooming in the Hardy Fuschia Garden at Glendale Garden. Fuchsias have been known for quite some time, the first type was brought back from the island of Hispaniola in 1703 by Charles Plumier( a french monk and botanist). He decided to name the plant after Lenard Fuchs(1501-1566) an early and important physician and professor of medicine in Germany. Magellanica commemorates Ferdinand Magellan(1480-1521) a Portuguese explorer who was the first to sail around Cape Horn from the Atlantic Ocean into the Pacific Ocean on the very southern tip of South America. 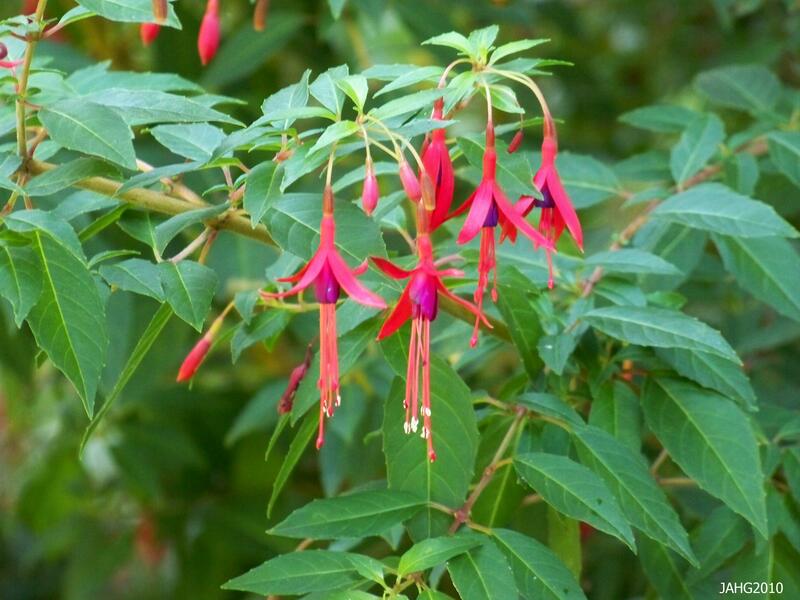 Fuchsia magellanica 'gracilis' shows off the delicate flowers which have been refered to as Ladys Eardrops. 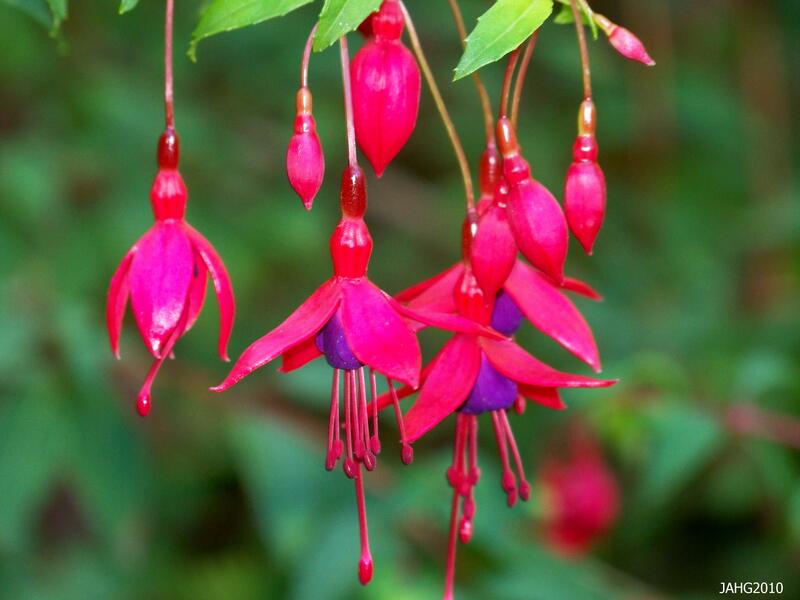 Fuchsias are found primarily in South America with Fuchsia magellanica coming from the farthest south; southern Argentina and Chile and to Tierra del Fuego. In Chile and Argentina it grows in the interior away from the coast up to the timberline there. It grows in damp to wet areas often on the edges of water(lakes, stream and rivers) or in swampy areas. It is in an area of high humidity with heavy rainfall, this is a good clue why it likes areas like the pacific north-west and lurks as an escaped alien lining roads in south-west Ireland. 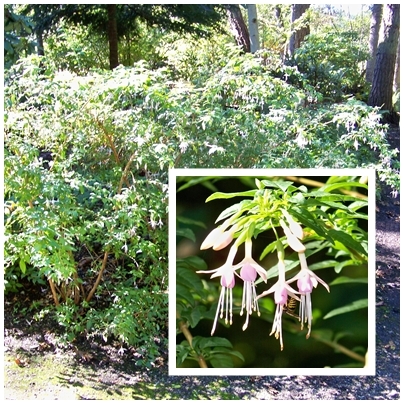 Fuchsia magellainca var.gracilis 'Aurea' brightens up any garden space. 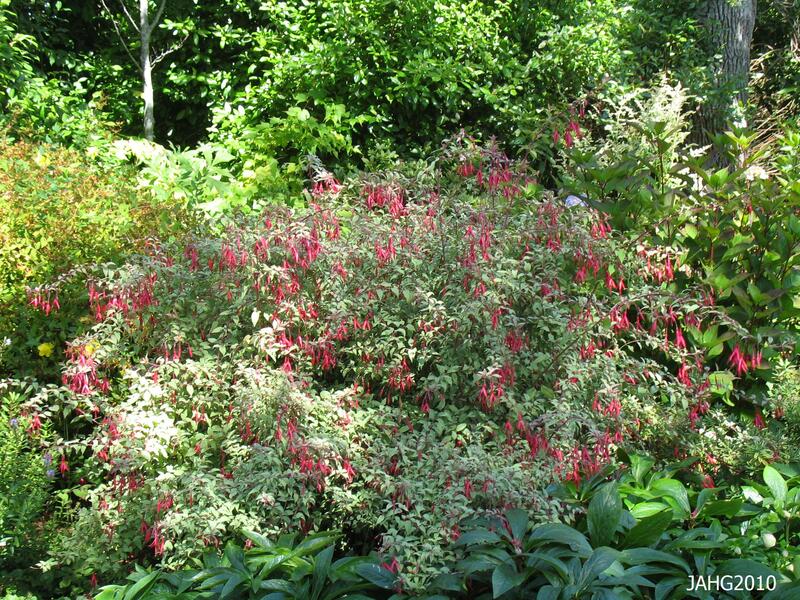 Over the years since it’s discovery many forms have been selected from Fuchsia magellanica, there are quite a few flower and leaf forms, some bright and showy and many others more subtle. The flowers range in color from the well-known fuchsia pink and blue through all pink, pale blush pink and then into white with a greenish tip. The flower itself also ranges in size and shape, most commonly being the long elegant drop, other forms are shorter to wider. 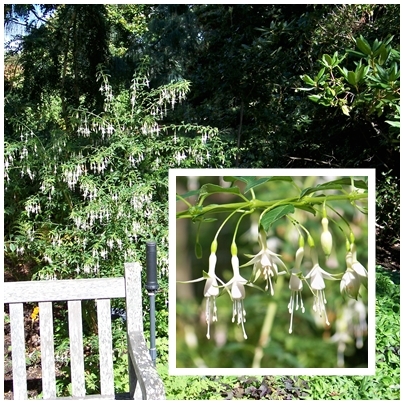 Fuchsia magellanica 'Hawkshead' has pure white flowers and light green foliage. Leaf colors of Hardy Fuchsia range from the standard green into golden ‘Aurem’ and several variegated forms; ‘Sharpitor’ with sage green with creamy edges, ‘variegata’ with more pinkish tints and cream edges, ‘Versicolor'(‘Tricolor’) with even stronger rose tintng. Fuchsia magellanica 'Versicolor' give an overall feeling of greyish-ness as the variegation is irregular and can disappear completely. 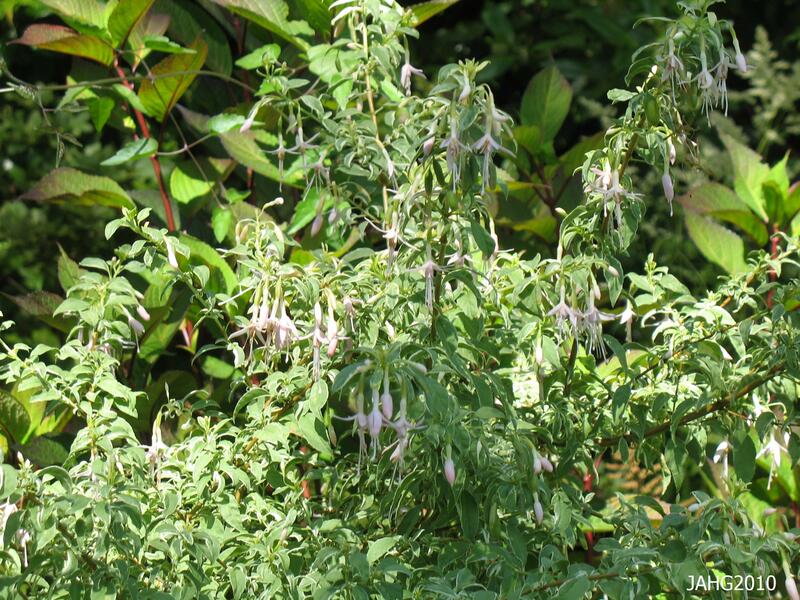 Hardy Fuchsias are very adaptable and useful in the garden. Although they come from a wet climate they have adjusted to the garden very well. They need rich moisture retentive soil to grow their best. They can take full sun as long as they have adequate moisture. At Glendale Garden here there is a Hardy Fuchsia Garden where many forms are tested, this area is mainly in full sun and exposed to the elements all year. It is a tough test for the Fuchsias to grow there and they come through with very well every year. They can grow in full sun to full shade, but the best placement is in part shade such as that provided by deciduous trees or those with smaller foliage so the light is dappled. 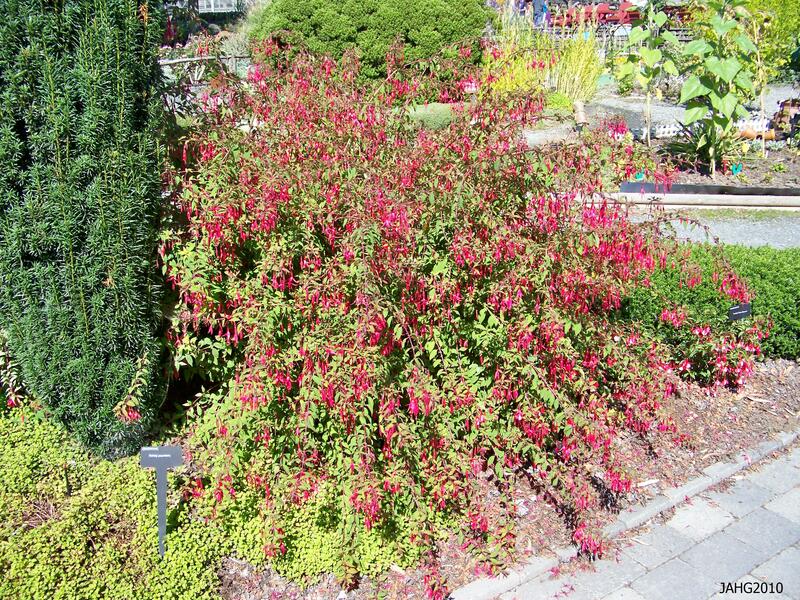 Fuchsia magellainca var. molinae 'Sharpitor' comes from England and is a very beautiful plant. Hardy Fuchsias grow into attractive delicate looking shrubs which range from 75 to 200cm(2-6ft) tall and can grow to nearly as wide. The variegated forms tend to be smaller in height but nearly as wide. These plants can fill many uses in the garden, from specimen to accent though informal hedge to container plants. 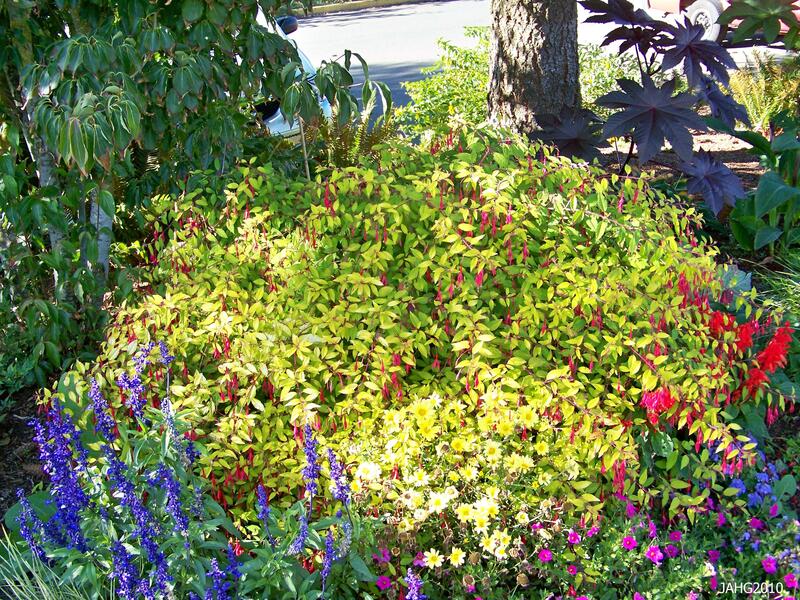 They fit well into perennial or shrub borders. They are said to be both deer and rabbit resistant.The large plum-colored oblong fruit is said to be edible, I have not tried it though. Fuchsia magellanica var. molinae (Alba) is one of the more commonly seen color forms. Hardy Fuchsias bloom on new wood and can be cut down nearly to the ground in the late winter before they start to grow a-new. My grandmother cut her plant down to 15cm(6in) every year. They also can be pruned at any time for shaping or removal of damaged limbs. One thing to keep in mind is they are slow to leaf out or sprout so do not throw it out it will come back. These are carefree plants with few if any seious pests or diseases. Often they come through the winter almost untouched here even though they are deciduous. They are rated at taking -10c(14f) with some varieties such as ‘Riccartonii’ and ‘Hawkshead’ said to withstand zone 6 -15c(5f). This unusual flower form of Hardy Fuchsia('Miss Popple'?) is seen at Milner Gardens in Qualicum Beach.